The Kiowas are of the great Athapascan family of Indians. In their war days they ranged from the Platte River of western Nebraska down into New Mexico and Texas. But their favorite hunting grounds lay south of the Arkansas River of western Kansas and southeastern Colorado. It was a desert country, of whity-yellow sand and sharp bare hills, with the Rocky Mountains distant in the west, and the only green that of the trees and brush along the water-courses. Nevertheless it was a very good kind of country. It had plenty of buffalo. The timber and the streams supplied winter shelter. The wagon-road of the white merchants, between the Missouri River and Santa Fe of New Mexico, ran through the middle of it and furnished much plunder. In the south, where lay Comanche land and Apache land, there were Mexican settlements that furnished horses. With the Comanches and Apaches, and with the Cheyennes and Arapahos north, the Kiowas were friends. To the Pawnees they were enemies, and their name carried dread through many years of fighting. Now in the summer of 1839, twenty Kiowa warriors left their village near the Arkansas River in present southern Kansas, to go down across Comanche country and get horses and mules from the Pasunke, or the Mexicans of El Paso, which is on the Rio Grande River border between northwestern Texas and Mexico. However, in those days all that region was Mexico. The head chief of the party was old Do-has-an, or Bluff. But he did not command. Gua-da-lon-te, or Painted-red, was the war chief. Dohasan would take command only in case Gua-da-lon-te was killed. Among the warriors there were Dagoi, and Kon-a-te, whose name means "Black-tripe." After several days' travel horseback clear across New Mexico they came to El Paso town, where many goods were stored on the way between New Mexico and Old Mexico, and where the people got rich by trading and by making wine from grapes. But they could see soldiers guarding El Paso; so they did not dare to charge in and gather horses and mules from he frightened Pasunke. Dohasan, who was wise as well as brave, advised against it. "Another time," he said. "We are too few, and we are a long way from home. Let us go, and come again. Maybe on the way up we will meet with luck among the other villages." They rested only the one night, and turned back, thinking that they had not been discovered. At the end of a day's journey through a bad, waterless land, they halted and camped by a spring, of which they knew. It was a big rock-sink or round, deep basin, with a pool of water at the bottom, and a cave that extended under a shelf. The Mexican soldiers must have struck their trail, or perhaps had followed them from El Paso; for early in the morning there was a sudden shooting from all around, and much yelling. Bullets whined and spatted, and horses screamed and fell over. "Into the cave!" shouted Painted-red. "Quick!" Hustled by old Bluff and Painted-red, into the cave they bolted. Nobody had been hurt, and the soldiers were afraid to venture in after them, but right speedily they found themselves badly off. The soldiers camped along the edge of the well, above, so as to kill them by thirst and hunger. Only in the darkness might the Kiowas, two or three at a time, crawl out of the cave, gulp a few swallows from the pool, maybe slash a strip of horse-meat, and scuttle in again. While doing this, Dagoi was shot in the leg, so that he could not walk. In a couple of days the dead horses began to decay, for the sun was very hot. The smell grew sickening. The flesh was sickening. One or two of the dead horses lay in the pool, and the water got sickening. The Mexican soldiers stayed close and watchful, and yelled insults in Spanish. But they had with them several Apache scouts; and one of the Apaches called in Comanche, so that the soldiers would not understand. "Be of good cheer, brothers," he called. "Be strong and hold out, until these dogs of Mexicans tire." The Kiowas had no thought of surrendering. They would rather die where they were, because if they surrendered, they would be killed anyway. Old Dohasan and others among them belonged to the society of Ka-itse-nko or Real Dogs�whose members were under a vow never to surrender. Part of them guarded the cave's mouth, and the rest explored back inside. At the very end there was a hole which let in daylight. Konate was boosted up; but when he stuck his head through, a soldier saw it and he had to duck down. Thereupon the soldiers stopped the hole with a large rock. When ten days and nine nights had passed, they all decided that they would either escape or be killed. The horse meat could not be touched; neither could the water. It was better to die in the open, like men, than to die in a hole, like gophers. The soldiers guarded the only trail that led up the side of the cliff wall, out of the well; but at another side there was a cedar which had rooted in a crack and almost reached the rim. By hard climbing a man might manage to scramble up and gain the open. But what to do with Dagoi, who had only one leg and was weak from pain? "You will not leave me, my brothers?" implored Dagoi. "It is true I am wounded, but if you leave me, I shall surely die. Perhaps you can carry me on your backs. Or wait a day or two, and the soldiers will grow tired." "No," said old Dohasan. "That is impossible. We must move fast, and to get you up the tree would make noise. If we wait, or if we stay, we will all die, and it is better that one should die than that all should die. "Have a strong heart, my son. You are a warrior, and you must die like a warrior." "Those are good words," he answered. "I hear them and they make me strong. I am a man, and I am not afraid. When you get home, tell my friends to come and avenge me." In the darkness Dagoi dragged himself to the pool, and sat beside it, waiting for daylight and the bullets of the soldiers. Old Dohasan sang the death-chant of the Real Dogs. Then he stepped silently out, leading the file of warriors to the wall under the tree, that he might be the first to climb and meet the soldiers in case they were on watch. Up he went, into the cedar, and on; up went all, one after another, as fast as they could. The camp-fires of the Mexican soldiers were glowing, right and left and behind and before, along the rim; but without a sound the nineteen gaunt Kiowas, bending low, stole swiftly forward, at the heels of Dohasan. They succeeded. But in finding horses, somebody made a little noise, and the Mexicans fired wildly into the darkness. However, answering not, and leading the horses out a short way, step by step, they were ready to vault on. "A bullet has gone through my body," said Konate. "But I will try to ride." "We must hurry," spoke Painted-red. The camp was all aroused. "Someone help Konate." Away they dashed, several riding double, and Konate supported in his seat by a comrade. Behind, in the well, Dagoi sat beside the pool and kept his heart strong for the end that would come by daylight. All that night and all the next day they rode, making northeast toward the desolate desert region of the Staked Plain, on the homeward way across western Texas. No Mexican soldiers would follow into the Staked Plain. When after hard riding they arrived at Sun-mountain Spring, on the top of a high, bare-rock hill near the Staked Plain, Konate's wound had spoiled in him and he could not sit upright on his horse. He was very ill.
"I am about to die, friends," he gasped. "Do not try to carry me farther. But go yourselves and some day come back for my bones." He spoke sense. Any one might see that he had only a few hours to live, and that soon his comrades would be carrying only a body across the Staked Plain, where the sun beat hotly and water was far apart. It was better that they leave him here, at the spring where they might find his bones. So on the water's edge they built a shade for Konate, with a few crooked cedar branches, and bidding him goodby they rode on, into the great Staked Plain. They expected that they would never see him again. What happened now to Konate, he often told, and he told it always the same; therefore it must be true. For the rest of the long day he lay there, with the sun beating down around him, and his mind and body very sick from his wound. He was unable to sleep. The sun set, and the air changed to cool, the twilight deepened to dusk; alone on his hilltop he closed his eyes, and waited for the spirit of the tai-me, or Sun-dance medicine, to bear him to his fathers. In the star-light he heard a wolf howl, far off. He listened, and the howl sounded again, nearer, from another direction. Then he knew that the wolf had scented him and was ranging to find his spot. That would be bad�to be eaten by a wolf and have one's bones scattered! Konate groaned. His heart had been strong, until this moment. He had hoped that his bones would be cared for. Soon he heard the wolf, at hand; there was the soft patter of its pads, and the sniffing of its inquiring nose, seeking him out. And now he saw the wolf, with shining eyes peering into the bough shelter where he lay helpless, unable even to speak. That was an agonizing moment, for Konate. But lo, instead of jumping upon him, the wolf trotted forward, and gently licked his wounds, and then lay quietly down beside him. Konate was amazed and thankful. While the wolf lay there, next he heard another sound, in the distance: the shrill eagle-bone-whistle music of the great Sun-dance of the Kiowa nation. The music drew nearer, and he heard the Sun-dance song; and while he listened, strong of heart again, he saw the medicine spirit of the Sun-dance standing before him, at the entrance to the shelter. "I pity you and shall not let you die," said the medicine spirit. "You shall see your home and friends." Then the medicine spirit brought down a rain, to wash Konate's wounds and cool his fever. The medicine spirit sat with Konate most of the night, and told him many things: told him how to make a new kind of Sun-dance shield, and also an a-po-te, or sacred forked staff, that should be a medicine staff and have magic powers. Toward morning the medicine spirit left, saying: "Help is near." Meanwhile the Painted-red party were riding on, and in the Staked Plain they met six Comanches, bound to Mexico after plunder. They spoke to the Comanches regarding Konate, and asked them to cover his body so that the wolves should not get it. This the Comanches promised to do, and continued to the Sun-mountain Spring where Konate had been left to die. But when they reached the spring, they found Konate alive and stronger than when his comrades had bid him goodby! That astonished them. They then knew that he was "medicine." Therefore they washed him, and gave him food, and putting him on an extra horse they turned back and took him home. The village, and all the tribe, also, were astonished to see him again. As proof that he had been visited by the medicine spirit, he made the medicine shield of a new design, and the apote, or sacred forked stick. He took the name Pa-ta-dal, or Lean Bull. 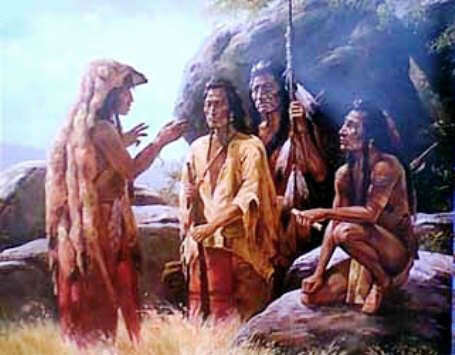 After that the keepers of the medicine stick bore the same name. Konate carried the medicine stick in the Sun-dance, for several years, and then handed it on to his nephew K'a-ya-nti, or Falls-over-a-bank, who became Lean Bull the second�but the white people called him Poor Buffalo. This apote was a two-pronged stick about four feet long, decorated with wild sage. It was smooth and had no bark, and was brought out only once a year, for the Sun-dance. The keeper of it used it for beating time, in the dance. At the close of the dance it was stuck, forks up, in the ground in the center of the medicine lodge, and left until the next year. When the stick was eighteen years old Konate's nephew planted it as before, at the close of the Sun-dance, in the center of the medicine lodge on the plain; and when the Kiowas returned, the next summer, for another Sun-dance, they discovered that the apote had been planted the other end up, and was putting forth green leaves! For a stick eighteen years old, without bark, to do this, was certainly great medicine. No one now might doubt the story of Konate, to whom the taime spirit had talked, under the bough shelter by the Sun-mountain Spring. None of the Kiowas dared to touch the apote, this time�or to stay near the medicine lodge. The dance was held at another place. When, ten years later, or in October, 1867, the Kio was met in a treaty council with the United States, near the present town of Medicine Lodge on Medicine Lodge Creek, southern Kansas, they were enabled to show that the apote had grown to be a large tree. Such had been the strong medicine of Konate, to whom, about to die from his wounds, in his shelter by the Sun-mountain Spring beyond the Staked Plain, the taime spirit had talked. Konate was dead; but K'a-ya-nti, his nephew, the other keeper of the stick, was still alive; and he knew.